It was on a Saturday afternoon in August that I got a phone call from a friend telling me that he was at Benezette for the annual PA elk tag drawing, and the 3rd bull tag drawn was matched to my name. I had been drawn for 1 of 2 bull elk tags for zone 8. As a life time PA resident and a hunter for 52 years, hunting 2-3 states (PA, NY, CO, NC, VA, to name some.) 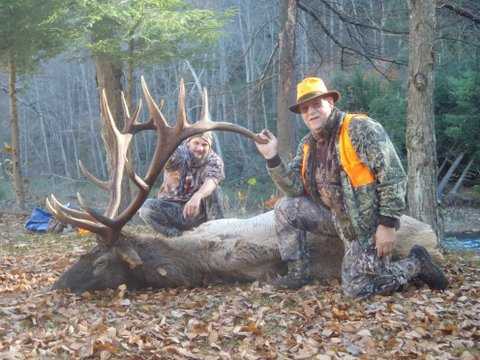 for more than 35 years, hunting elk in PA is something that I would like to add to my hunting career. After all I have taken bears, buffalo, whitetail deer (Over 200), wild turkey (Over 100), and about all the small game that PA and other states have to offer, so why not a PA elk. After telling my wife that we better wait until the hunt was over to buy some beef for the freezer, I told her that I was going to have to step up my bow practice as I would attempt to hunt this bull with a bow arrow. It seemed the logical weapon of choice because I have hunted most of my life with bow and arrow and have taken most of the small game and big game with the bow. 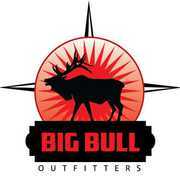 After interviewing several outfitters to guide me on this hunt of a lifetime I had chosen Big Bull Outfitters of Byrnedale PA after spending a day with Jarred and Eric McCarthy it was obvious to me that they had the edge over the other outfitters because they were bow hunters too, and they knew what my needs would be. It was decided that day that Eric would be my guide. I knew I was in good hands. Mid Sept. my cousin David and I went to Benezette to look around and see some elk, and some bulls in full rut. We both have been out to CO elk hunting with our bows and David had scored several times but I never was able to connect with a bull. On Saturday evening I was driving down Rt. 555 and spotted a big bull with 18 cows, he was huge and I was able to get some photos of him lying in the field, telling David that I thought he was big enough that Eric would let me shoot him if I got the chance. Due to the onset of PA archery season as well as NY archery season I would not make it back to Benezette until Oct. 30, the day before the elk season opens. Fast forward to Oct. 30 upon arriving at elk camp and settling in Eric told me to get on some camo and we would go take a look at the bull that we would hunt for at least 2 or 3 days. He took me to a high ridge that we could see down into a bottom, there were 5 bulls and about 18 cows bedded in the bottom. Eric told me to look at the dark antlered big bull lying in the middle of all the elk, as I did I was taken a back some and told Eric that I knew this bull already and that I had photos of him from back in Sept., and that he was a 7x8 bull. 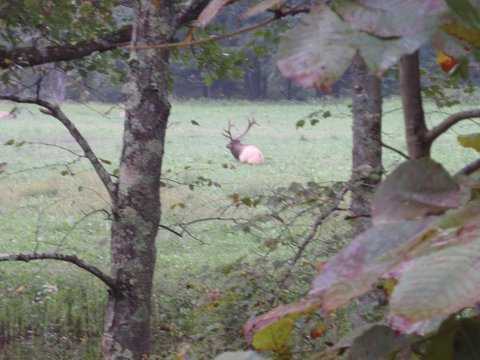 So, I was going to hunt a bull that I had seen earlier in Sept. Eric confirmed he was big enough to shoot. Trying to get this bull alone and on public land or private land we had permission to hunt was not easy and we hunted another bull on Wed. morning to no avail. So, I went back to camp for lunch and Eric and Jarred were going out to see if they could find the 7x8, I told them if they could find him bedded by himself on land we could hunt, that I could do the stalk on him to get me into range. I was about to take a nap when Jarred pulled in and said "Come on we gotta go, we have him bedded on State Game Lands." After a short stalk planning meeting, I was able to put myself within 34 yards of the bull before he stood up offering me a broadside, steep uphill angle shot. I released the arrow and it looked good but I told Eric And Jarred that there was a loud crack sound at the hit and I was not happy with the penetration of the arrow. After we waited for a half an hour we took up the track and as I feared the shot was not as good as I would have liked. We tracked the bull the rest of the day till dark. That evening we received a message from WCO Wagner that the bull had been seen at a group of camps with an arrow in it. I told Eric that it wasn't just an arrow but it was my arrow and I was very upset about that. Eric assured me we would catch up to the bull in the morning, I was not so confident. Next morning was Nov. 3 and we went looking for the bull, after a while we split up and Eric told me meet him back at the truck. At his arrival to the truck he told me he had good news and bad news, good news was that he had found the bull and it was only about 100 Yd. from the truck, but the bad news was he was on private land that we could not get permission to go on. We could see him from the road and he appeared to be in a bad way, not wanting to walk or go up hill, and difficult for him to lie down. I hunted him that evening in the hope that he would leave the private land, but he didn't. Late that night we spot lighted him and he was not far from where he was in the morning and all he had to do was cross Bennetts Branch to be on State Game Lands so maybe in the morning we could get another chance at him. Next morning Fri. Nov.4 the bull had indeed crossed Bennetts Branch and was really hurting as he had only crossed the creek from where we saw him the night before, maybe a 100 Yd. or so. After some discussion, we decided it was in the best interest for the elk, me, and the Game Commission's concern, that I take my rifle instead of the bow. We had him where I could shoot him, he was only a 100 Yd. from where I couldn't shoot him and only 300 Yd. from the western edge of my hunt zone. Using the gun is not what I really wanted but I had to do what's best for the bull and all concerned. After some maneuvering I was able to get a shot in him and I thought he was going to drop but instead he staggered out in the creek where it is not legal to shoot and stood there until he finally lay down and died, in the middle of Bennetts Branch. He was indeed a monster bull, he green scored 372 B&C points and weighed 813 Lb. second largest bull of the 2016 season. From applying for a bull tag in zone 8 for 15 years to seeing this bull in Sept. to finding out I would be hunting this bull to actually killing this bull in Nov., all I can say is it was in our Destiney to meet. No other way to explain it. All of these things had to fall in place for this to have happened. Upon close examination at skinning and quartering the bull we found that my arrow had penetrated 12 in. and due to the steep uphill angle, the broadhead had just touched the bottom edge of the left shoulder blade and then centered a rib that was cut off completely then entering the upper lobe of the left lung. He would have surly died from this wound, but when and where are unknown and we did the humane and right thing by using the rifle to finish the job. A big thanks to Big Bull Outfitters for this hunt. I was well taken care of, feed well, and had a great time. Great job guys! Excellent bull and good decision. It was the humane thing to do as u wouldn't want to lose a bull like that, now the Problem is...where ru going to hand that big mount?